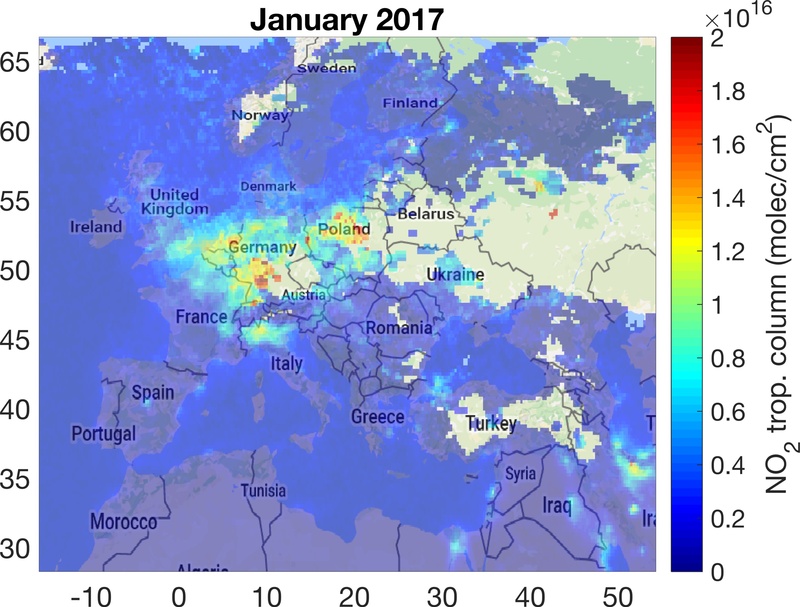 ILMApilot project started in October 2016 with the aim of increasing the societal impact of satellite-based atmospheric observations for air quality monitoring. 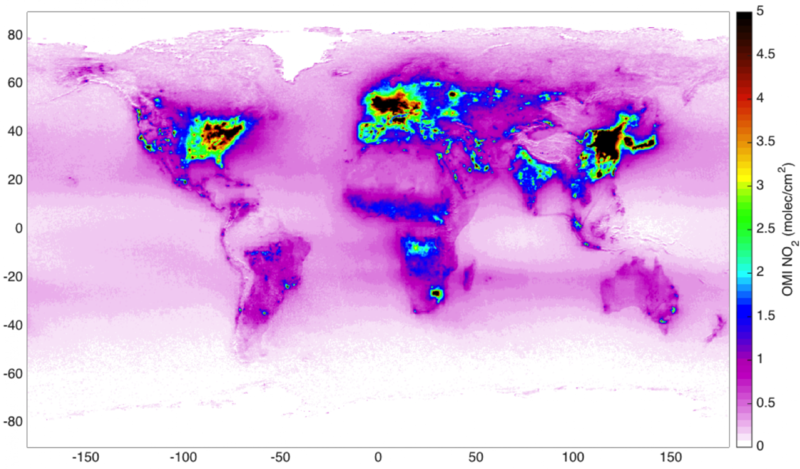 In particular, ILMApilot focuses on the application of satellite nitrogen dioxide (NO_2) observations for monitoring air quality at high latitudes. Why are we interested in NO2? NO2 is a pollutant gas produced through fossil fuel combustion. Satellite instruments are able to measure the NO2 content in the atmosphere by using the Sun light. Currently, atmospheric NO2 observations are available from the Dutch-Finnish Ozone Monitoring Instrument (OMI), flying onboard NASA’s Aura satellite since October 2004. 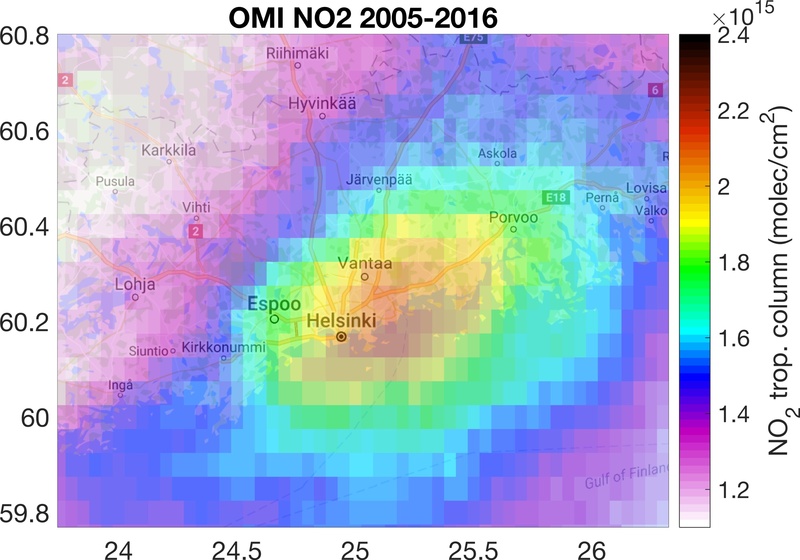 Satellite-based data can be used, for example, to provide pollution maps (as shown in the picture above for the Helsinki area) and to find out how the pollution levels change with time. One interesting result was that pollution levels during the weekend are found to be lower than during the rest of the week. These results attracted some attention by the Finnish media as you can read here (well, if you are a Finnish speaker). Also, the Helsinki local environmental authority (HSY) used these maps for their annual air quality report. Now, we hope to further improve the impact of these results, introducing data from new satellite instruments and involving new collaboration partners. ILMApilot is funded by the Academy of Finland under the “Key project research funding: Forging ahead with research”. One of the peculiar features of this call is the importance of the interaction between researchers and users as well as the general public. For this reason, traditional dissemination approaches suitable for the scientific community (e.g., scientific publications in peer-reviewed journals or scientific conferences) did not seam to be sufficient. So, here we are! This blog will work as project report as well as direct communication channel to reach a broader audience. If you are interested on how to improve the impact of scientific research this is the place for you. I’m preparing the first post to describe the purpose of this blog. Stay in touch!